Can’t find the proper ingredients to mix your own soil? 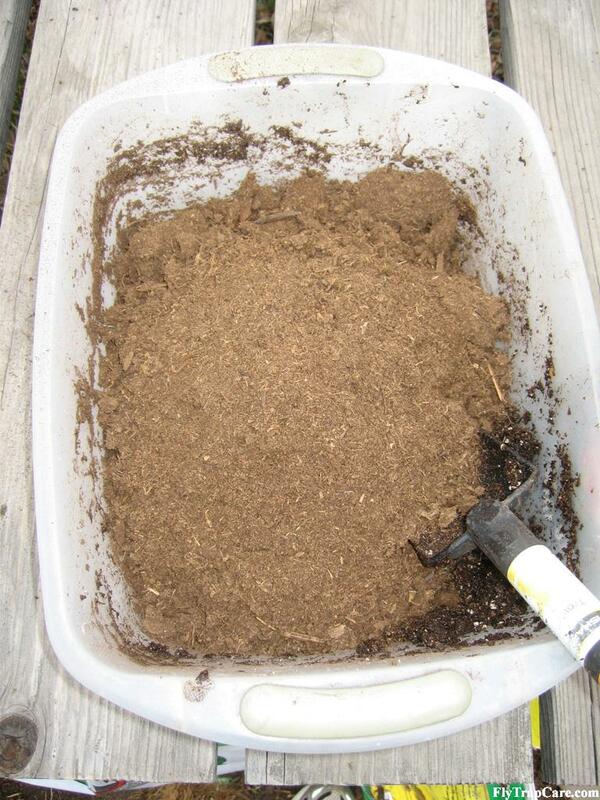 Buy Venus fly trap potting soil or New Zealand Long Fiber Sphagnum from the FlytrapStore. It is very important to use nutrient POOR soil to grow Venus Flytraps. 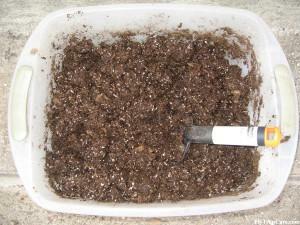 Regular potting soil will burn the roots and kill the plant very quickly. Fertilizing Venus Fly Traps is also not recommended. The fertilizer will burn the roots and likely kill the plant. Some experts use extremely diluted fertilizer and apply it only to the leaves of the plant, but this is risky for a beginner and not recommended. Dionaea aren’t terribly picky about the medium you use. Perhaps the easiest medium to use is simply pure, unenriched (NO Miracle-Gro!) 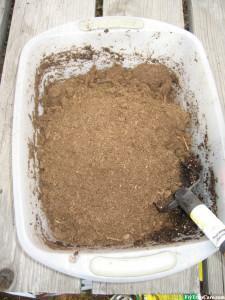 peat moss or long fiber sphagnum moss. 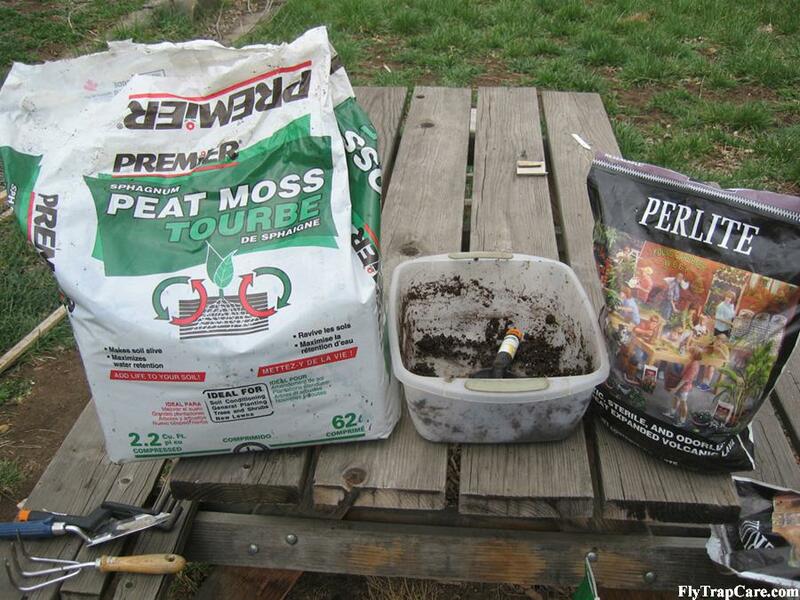 Peat moss is typically sold in large bales at most retailers that carry potting soil. It seems that the most widely accepted medium to use when potting Venus fly traps is a 1:1 mix (in terms of volume) of peat and perlite. When choosing a brand of peat moss, any type will do as long as it isn’t enriched. Be sure to avoid brands like Miracle-Gro and Scott’s because they contain fertilizer that will burn the roots of your plant and eventually kill it. 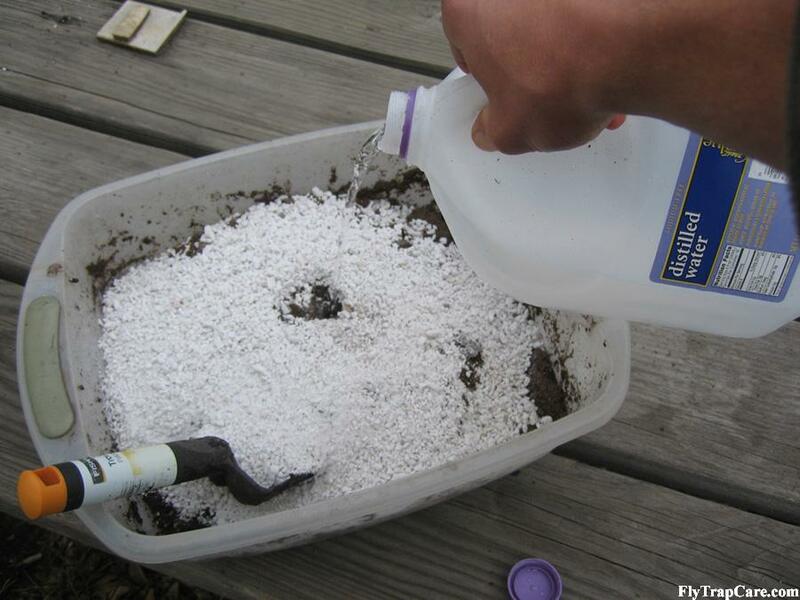 Perlite is also relatively easily found at large deparment and hardware stores, or at your local nursery. 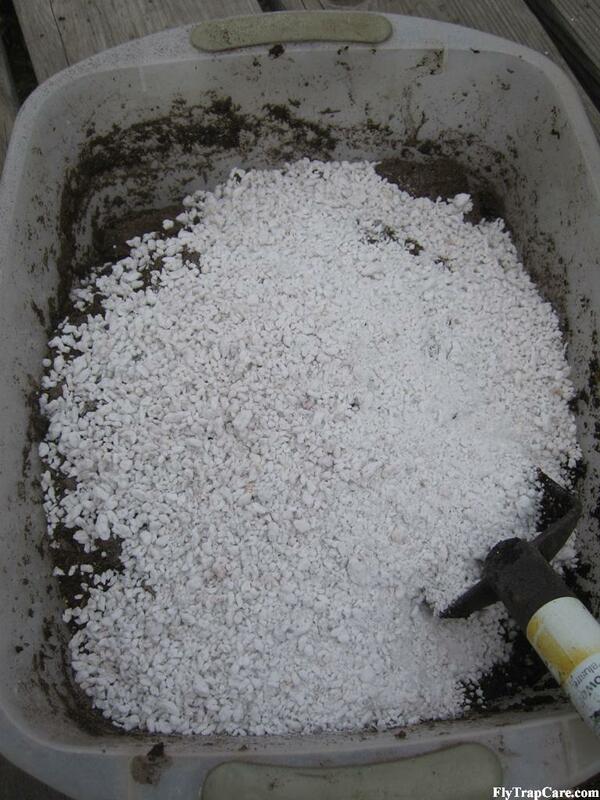 Perlite provides aeration and optimum moisture retention. Many people substitute silica or horticultural sand for perlite. This 1:1 mix of peat and perlite is commonly referred to as the “standard” CP (carnivorous plant) mix, because most all carnivorous plants grow well in this medium. Many growers like to use the standard CP mix and then top it off of long-fibered sphagnum moss to prevent the perlite from floating to the top. I found that the perlite has a strong tendency to float to the top of the mix if it is exposed to heavy rains. Our preferred mixture of soil for Venus fly traps is 5 parts peat moss, 3 parts silica sand and 2 parts perlite by volume. The silica sand really helps with aeration and the formation of a very healthy root system. 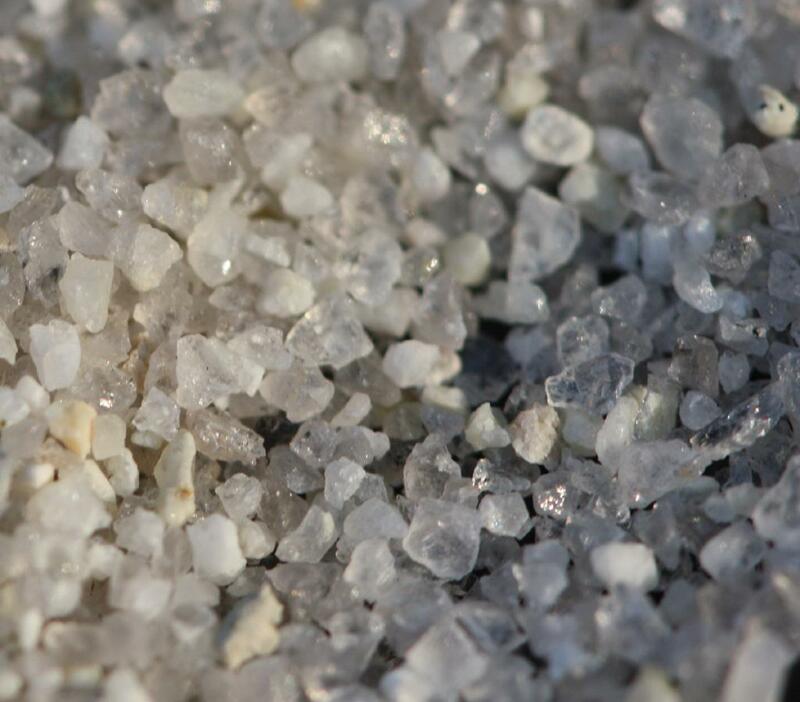 Silica sand is also known as white sand, silicon dioxide, silica or quartz. It is a very hard mineral that is not soluble and is completely neutral and inert, which makes it perfect for carnivorous plants because it will not release any minerals into the soil. Choose an adequately large container that will allow you to mix the peat and perlite without spilling it. A five gallon bucket works well. Choosing the right pot for your Venus fly trap is an important process. It can mean the difference between a small plant that struggles most of its life and a large, robust, healthy plant that flowers to produce a lot of seed and divides regularly. While Venus fly traps can get by in a wide variety of pot sizes and shapes, they prefer to have a pot with good vertical depth so that their roots have room to grow. Venus fly traps can be grown in anything from short 2 inch pots all the way up to pots as big as they come. I find that pots between 4 inches and 5 inches in depth are a good comprimise for space while still providing enough depth for the roots of the Venus fly trap. But in general, the deeper the pot, the better it will be for your pet Venus fly trap. Another important characteristic of a good Venus fly trap pot, especially in climates with more extreme temperatures, is good insulation. An insulated pot will provide a stable temperature for the roots and help prevent the pot from heating up the soil when sunlight directly hits the sides of the pot. It will also provide a bit of protection from the soil freezing when the temperatures dip just below freezing. Plastic pots are easy to find, cheap and will work well for Dionaea. However, most plastic pots are dark in color and therefore absorb heat. Given the fact that they aren’t insulated, the soil temperature can rise and fall quickly in the pot. Having said that, I’ve used these pots successfully and my plants did well. But when I made the switch to insulated pots, the difference in their health was noticeable. My preferred inexpensive pot choice at this point is 16 ounce insulated foam beverage cups, or styrofoam cups. They’re white, so they don’t heat up much in direct sunlight. They provide excellent insulation for the roots of the Venus fly trap, and at over 4.5″ tall, they provide good vertical space for your Venus fly trap to develop a healthy root system. To top it off, you can purchase twenty of them for one dollar, so the price is right! Repotting a Venus fly trap is actually quite an easy process. The basic procedure is to remove the plant from its current container, remove the soil from its roots and pot it in its new container. Below you will find a detailed step-by-step procedure of how to accomplish this task while causing your Venus fly trap the lease amount of stress so that it can quickly recover and resume growing. Begin by finding a good work area where you can make a mess. An outside picnic table or work bench is perfect. One term that you’ll need to know before we start is rhizome. The rhizome of your plant is the white bulb-like part that’s just below the soil, but above the black roots. It’s the area that all of the leaves on your Venus fly trap originate from and where the plant stores energy. With that term defined, let’s get started! Once you’ve prepared your desired soil mix as described above and it’s moistened all the way through, simply fill the chosen pot with the soil mix and gently compress it. Using a stick, screwdriver, your finger or some other tool, make a fairly deep hole for the roots and rhizome of the plant to go into. Make the hole deep enough to accommodate the roots with minimal winding. Be sure to make the top a bit wider than the bottom so that you have plenty of room for the rhizome. Gently squeeze the sides of the pot that your Venus fly trap is currently planted in to release the soil from the pot. Then slowly turn the pot over with one hand while placing your second hand under the pot to guide the ball of soil and plants out of the pot. Once you have the old soil and plants free from the original pot, start breaking away the soil from the roots. Do this very gently and methodically to be sure not to tear or otherwise damage any of the roots. You can also simply dunk the entire soil ball into clean water (rain, reverse osmosis or distilled water) and swirl it around to release the soil. Hold the rhizome of your plant in one hand. With your other hand, use the tool of choice (screwdriver, stick, finger, etc.) to guide the roots of your Venus fly trap down into the hole in the soil of the new pot that you made in step one. Try to get the roots as straight and deep as possible into the new pot. Work them all the way down until the rhizome is setting just below the surface of the soil in the hole you created. Once your Venus fly trap is placed down far enough in the soil with its roots deep into the pot, start pushing soil in around the rhizome. Sometimes it’s easier to use extra soil from your mix to drop into the hole. In whatever way is easiest, fill dirt in around the roots and rhizome thoroughly. Then gently press soil in around the sides of the rhizome to make sure that it’s seated well into the soil. Do not plant the Venus Fly trap too deeply in the soil, but make sure that the white part of the rhizome is completely covered. Watering the Venus fly trap after repotting will help ease the root shock and also help the soil to settle and remove air pockets. Water from the top gently so that the perlite and silica sand (if you’ve used any) doesn’t all come to the top of the soil. I usually pour the water directly on the plant itself so that the soil isn’t disturbed too much. Make sure the soil is initially very wet after being potted. If you have any more questions, be sure to read the Venus Fly Trap Soil FAQs or join the forum and ask there: Venus fly trap forum.